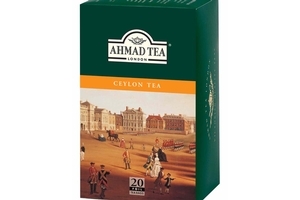 Ahmad Tea London Ceylon Tea in 1.41oz (40g) box. Contains 20 foil-wrapped tea bags per box. Sri Lanka is often described as the island jewel of the Indian Ocean and Ceylon teas are as rich and inviting as the history and heritage of the land itself. Our Ceylon tea is a blend of the finest high-grown teas from the hillsides of Sri Lanka. A delicate bright tea with a distinctive flavour and a beautiful golden colour. The rich amber brew fills the mouth with an invigorating and satisfying burst of flavour that is brisk palate tingling yet refined. It can be served with milk or a slice of lemon for a truly refreshing experience. Pair with croissants or pains aux raisins at breakfast or with traditional afternoon tea sandwiches, rich fruit cakes and sweet pastries. Product of UK.